Sitting majestically on a hill perched high, deep in the heart of Umbria, you will find Todi – an extraordinary Roman-Medieval town. 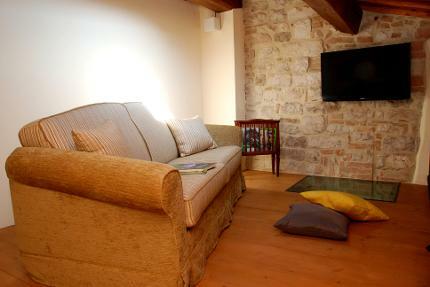 Its origins are ancient, Etruscan, Roman and medieval, Todi still retains that medieval air today. One of the many reasons why purchasing a property for investment, a holiday home or summer holiday rental is a choice you will not be dissappointed with. Todi was given the prestigious title some years ago of the “Ideal City” by a group of American researchers who stayed for 5 years. Todi has many fine churches and boasts the beautiful Basilica of Santa Maria della Consolazione, one of central Italy’s best renaissance churches, based on the Greek cross and a feast for your eyes. The Piazza del Popolo is one of the finest in Italy and boasts three public palaces, one of which is a museum. Take a short walk from the Church of San Fortunato, at the very top of the hill, and you will find a beautiful park with 360 degree vistas of the Tiber valley, surrounded by cypress and fir trees and a great place to have a picnic and find a shady corner in the hot summer sun. Todi abounds with many fine restaurants and bars and has a year long events calendar. Summertime is a joy, with al fresco musical concerts held during August, a fine arts and antique fair throughout the year, Todi in Flower in May, Todi Tango Festival in June an international hot air balloon event in July, Todi Arts Festival in August and not to mention the many festas held throughout the year. 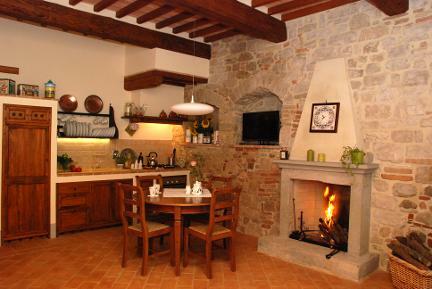 We have a stunning selection of properties in Todi and its environ – both for sale and for rental. 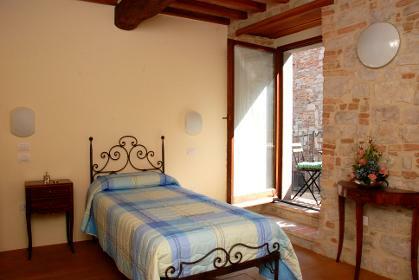 Below is Casa Borgo for holiday rental in the walls of this stunning town. 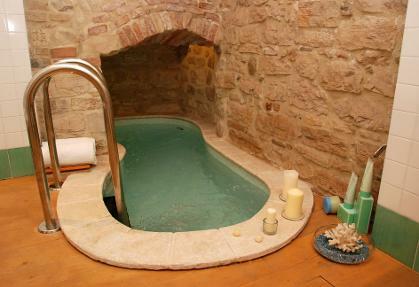 A beautifully appointed townhouse in the heart of majestic roman-medieval Todi – spread over 4 floors, spacious and luminous with high level furnishings and fittings and stunning features such as a sunken Roman tiled spa bathtub, a mix of ancient brick and stone walls and furniture whch combines both traditional and modern contemporary designs, with all the comforts you would expect in order to provide guests a most memorable and unforgettable stay. 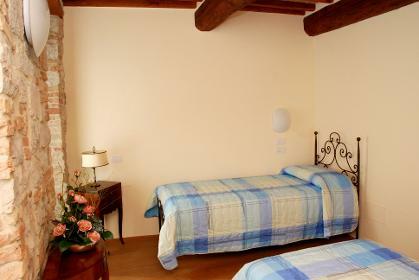 To complete the absolute authentic feel, each room has the characteristic beamed ceilings. No expense has been spared to make that home away from home experience and more. All fittings and furnishings are completely brand new. Renaissance Deruta ceramic vases adorn many shelves, hand crafted iron headboards, storage racks and handrails throughout the house. The property is accessed via beautiful iron framed doors onto a porch area; luminous and noise resistant double glazed French doors provide access to the spacious kitchen/dining room. The French doors are fitted with fine voile/linen drapes for privacy but also provide the perfect opportunity, on hot sunny days, to open out and have the fresh breeze enter the kitchen/dining room whilst still retaining the utmost privacy. The kitchen/dining room is a wonderfully spacious room, fully fitted with oak kitchen units with sliding drawers and Bosch hob and oven, fridge/freezer, wood dining table to seat 6 persons. A lovely corner seating area to seat 4 guests; gorgeous feature stone fireplace which adds to the ambience of Italian living. A flat screen tv is perfectly placed on one of the stone recesses and there is a feature decorative dresser filled with crockery. Coffee making machine/toaster/kettle are all available. Leading from the kitchen is a utility room with washing machine/ironing board and iron. The bathroom on the ground floor comprises the stunning sunken tiled Roman bathtub – an absolute luxury and sheer indulgement. From the ground floor leading to the first floor up a hand crafted tiled staircase, we arrive at a beautiful luminous double bedroom – with two single bed; two French doors lead onto the long balcony for outdoor space – complete with table and chairs. The spacious bathroom comprises walk-in shower unit bidet.toilet and sink. 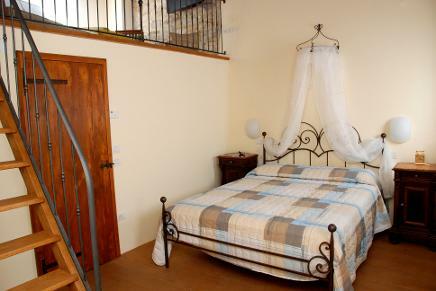 Up a flight of stairs to reach the second floor, we arrive at a beautiful romantic double bedroom with two windows and built in wardrobe which again has its own large private bathroom with walk in shower, bidet/toilet and sink. All bathrooms have plenty of iron storage shelves. Accessed via the bedroom, up a flight of wooden stairs, is a mezzanine area with iron ballustrades, and leads to a fantastic relaxing lounge area with sofa – which converts into a sofabed – large flat screen tv, side units/lamps and an olive wood table with chess board. An absolute haven of tranquility at the end of a busy day sightseeing. Casa Borgo therefore is ideal for a large family or two sets of friends perhaps, whereby with its well thought lay-out provides ultimate privacy on each level. Other interesting and unique features include “all room” lighting on entry with a flick of a switch – all rooms are illuminated. Umbria is an enchanting and mystical region which lies next to Tuscany and therefore in a most perfect location in central Italy. Known as the green heart of Italy, the region has a wonderful mixture of panorama, rolling hills covered with vineyards, olive groves and fields of sunflowers, medieval hill towns dot the landscape,, mountains with pine forests and its lakes and waterfalls. Lake Trasimeno is no doubt a mystical lake, a favorite with Italians, where you can take a 15 minute boat ride to reach one of the Islands famous for lacemaking and lovely lakeside restaurants. World famous places such as Assisi, Orvieto, Perugia, Spoleto are just 40 minutes away from Todi. Also Deruta, home to the world famous Renaissance majolica-ceramics, only 20 minutes drive away. Umbrian olive oil is one of Italy’s finest and its wines especially the renowned Orvieto Classico bianco, the wonderful Grechetto, a fantastic straw coloured wine and for a strong red, Montefalco Sagrantino will sure to impress the most discerning of wine buffs. Umbria’s cuisine, like Tuscany, is rustic and hearty, where in autumn months a plethora of tartufo/truffles, mushrooms, lentils are found widely available on riestaurant menus.